Talking is a great way to relax your patients each visit. 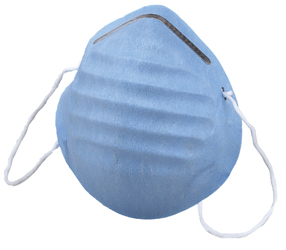 You need a guard to avoid both giving and receiving airborne contaminates. With the Face Mask Cone Mask Style Ear Loop, you can have infection-free conversations with each patient. Made from quality material, each mask comes with a nose wire for a secure hold to prevent slippage, while the cone shape fits your face naturally. Purchase the Face Mask Cone Mask Style Ear Loop for your office today. Sanitation is crucial when it comes to patient care. Keeping your dental office clean and sterile will provide worry-free visits from each patient. As a dentist, personal hygiene is an integral part of your day-to-day operations. Control the spread of infectious materials with one of our various products.